A graceful expression of your best wishes. 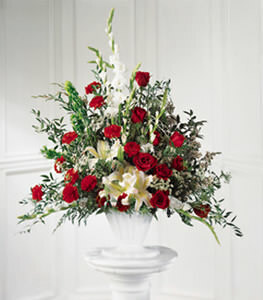 This arrangement features red roses and white lilies surrounded by white gladiolus and red carnations. Appropriate to send to a funeral home or memorial service. Thank you for delivering so quickly. I just got the call that the order was received & loved it.